Bluewaters Island is a project to make Dubai grow bigger and better with the main attraction “Dubai Eye”. It will be built on another man-made island opposite to Jumeirah Beach Residence coastline near Dubai Marina. Project was announced and approved last year by HH Mohammad Bin Rashid Al Maktoum. Bluewaters Island’s construction has been started on May 20, 2013 and is expected to be complete in 2018. Meraas Holding is a company behind the project with Dutch company Van Oord. Van Oord are known due to their work on Palm Jumeirah. The construction is expected to cost AED 06 billion (US $1.6 billion) that will be including Dubai Eye. The project will have Entertainment, Residential, Hospitality and Retail Zones. Main feature will be 210 meter tall Worlds Largest Ferris Wheel called Dubai Eye. On its completion in 2018, It will become the largest ferris wheel in world beating current tallest ferris wheel 168 meter tall High Roller in Las Vegas. Dubai Eye will be even taller than 190.5 meter tall New York Wheel for Staten Island, Which is expected to open in 2016. Out of total AED 6 billion cost Dubai Eye is estimated to cost AED 1 billion. The base of the Dubai Eye will be serve as an entertainment zone. It will have a large LED screen mounting on the wheel and will be used as for broadcasting, advertisements and other information. 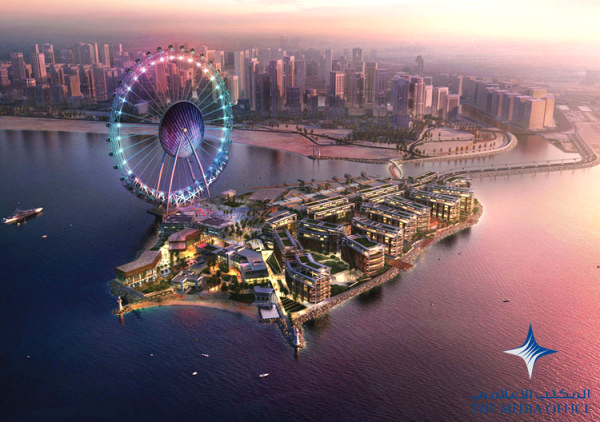 Bluewaters Island and Dubai Eye project is planned with 3 millions visitors every year in mind. That will make it as one of the largest tourist hot spots in the world. That is why we stated that it will let Dubai grow Bigger and Better for sure.